Chevrolet and Oldsmobile Animated Ads from the 1930's-1950's. Publisher: Frederick J. Drake & Co. 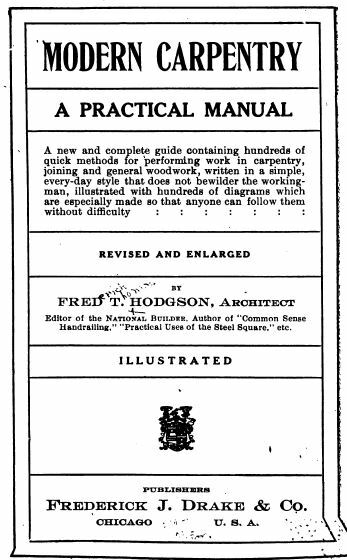 This textbook at the time was written for carpenter's of all skill levels. It is almost a geometry textbook, as it covers in great detail the understanding a carpenter must have for figuring out how to measure and cut different dimensions and shapes. Carpenter's must be mathematicians in order to apply their craft properly and this book shows them the way. Great for the old woodworker as well as the woodworking student.